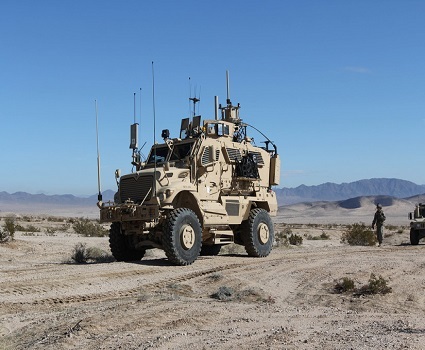 FORT IRWIN, Calif. – An Electronic Warfare Tactical Vehicle supports a training rotation for the 3rd Brigade Combat Team, 1st Cavalry Division at the National Training Center here, Jan. 13, 2019. Acting Defense Secretary Patrick M. Shanahan, Joint Chiefs Chairman Marine Corps Gen. Joe Dunford and Defense Department Comptroller David L. Norquist went to Capitol Hill to make the case for the Defense Department’s request for fiscal year 2020 funding. The department is seeking $718.3 billion as its part of President Donald J. Trump’s topline request of $750 billion for national security funding. Shanahan told the Senate Armed Services Committee that the request represents the largest research, development, training and evaluation budget in 70 years. It includes increases in space and cyber investments, modernization of the nuclear triad and missile defense capabilities, and the largest shipbuilding request in 20 years when adjusted for inflation. It also calls for the largest pay increase in a decade for service members Dunford noted that capabilities developed by China and Russia limit the U.S. military’s ability to operate freely in space, cyberspace, land, sea and air. The capabilities identified in the budget request are designed to allow the United States to project power when and where necessary to advance its interest in the context of that emerging threat. 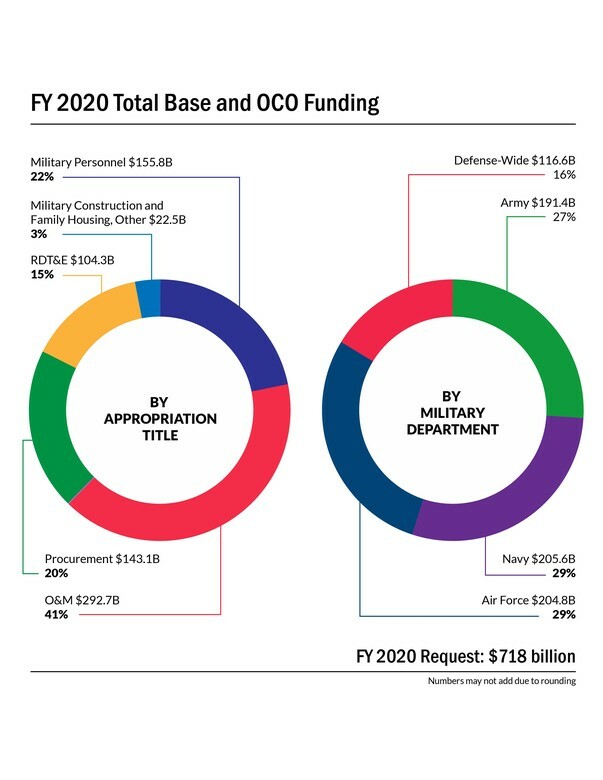 Defense Department officials announced the details of DOD’s fiscal year 2020 budget request March 12 at the Pentagon. The budget request reflects focus on the great power competition with Russia and China, as called for in the 2018 National Defense Strategy. The past two budgets did begin to focus on the NDS, but the greater focus was on replenishing depleted munitions stocks and addressing readiness concerns that were the result of sequestration. Space and cyber are the two newest warfighting domains. They got a big boost in defense dollars: $14.1 billion for space, a 10 percent increase over last year’s budget, and $9.6 billion for cyber, a 15 percent increase over last year. In space, funds will go toward standing up the new Space Force, space communications, space-based warning systems and space launch capacity, and position, navigation and timing. Cyber funding will go to improved offensive and defensive capabilities, protecting the network and moving to a multi-cloud environment. Multidomain operations is a relatively new concept of the joint force. Future battles will be fought on land, at sea, in the air and in space and cyberspace, with allied troops operating together across all five domains in support of defeating the enemy. The budget request asks for funding for multidomain weapons and equipment upgrades. 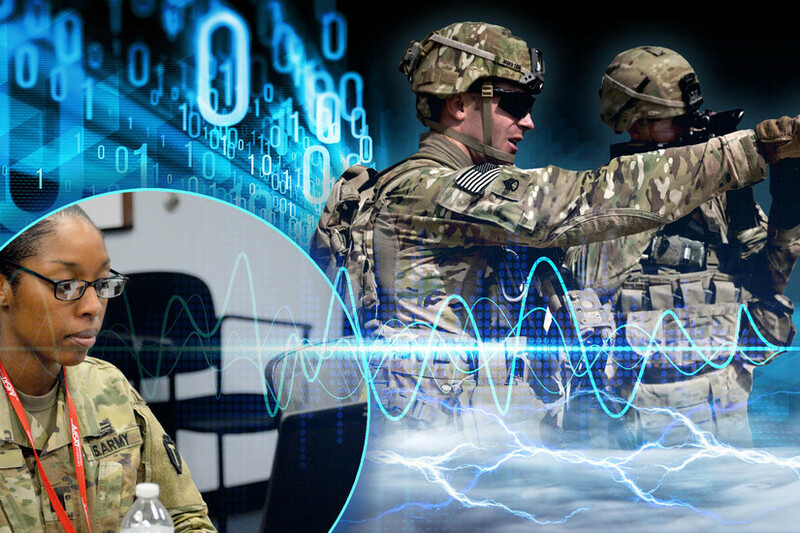 DOD has requested $2.6 billion for disruptive technologies such as hypersonics, $3.7 billion for unmanned and autonomous systems, $235 million for directed energy weapons, and $927 million for artificial intelligence and machine learning systems.